This dive on the Lincoln Highway is another former one-stop filling station, drive-in cafe, and mobile-home dealership. The name is clearly grandfathered beyond any lawsuits that a newer business sharing the same name would encounter. Today, only the cafe is left, with its bright yellow signs pulling travelers in for ice cream, beef burgers and multiple pork sandwiches. Location: 1620 Lincoln Highway, in Nevada, Iowa the seat of Story County. About thirty miles north of Des Moines. Directions: Take the Lincoln Was exit off I-35 in Ames and turn right. Starbuck's Fast Food is on the East side of Nevada on the Old Lincoln Highway route. Old Lincoln Highway also leads to another, more famous, Starbucks in Ames. The Tenderloin: Described on menu as homemade. This came with two wrappers for its slightly large size. Taking of wrappings revealed a thin piece of pork loin stuck to a large half dry bun. the moisture of the tenderloin had moved into part of the bun. The cut of pork loin was thin enough to have a slight wave form, with a small thick part on one side. The breading was thick with more crunch than steamy pork. Overall, not inspiring, 5/10. Also on the Menu: Full ice cream menu, "pork fritter" hints at another low-quality fried pork sandwich. Breaded pork chop is an occasional special. Coney dogs and loose meat burgers complete the menu. Service: Counter service with number called when order is ready. A team of high-schoolers was working the kitchen and register. Ambiance: There is an austere dining room with wide windows and natural light and one picture box with the history of the restaurant. There are booths and tables for seating. Final Thoughts: This is another thin cut of pork loin with minimal effort to improve the sandwich. Its not any better than some frozen or pre-formed tenderloins. The one-stop service and food stations on the Lincoln Highway have some great greasy food experiences, this just isn't one of them. I don't like their tenderloins all that well either. However, I could eat their chili-beefburgers all freaking day long. This restaurant is absolutely amazing. You are very wrong about it. I have worked there for 3 years and think everything we make and have is great. We put a lot of time and effort into our food-- tenderloins, sherbet ice cream, soups, etc. i beleive they are the best of the best. I do not appreciate you saying these things about Starbucks either. You have a lot of things incorrect on here as well. Your opinion is biased because you work there. He didn't bad-mouth the entire restaurant, just one sandwich. He's a food critic and he's right about the tenderloin - nothing special at all. Just settle down. This person obviously knows nothing about food. Ask anyone around Nevada who has the best homeade pork tenderloin and they will say STARBUCKS. I love their ice cream!!!!!!!!!!!!!!!!!! Their Cyclones are the best. Even after their posted closing time, they served us. Pretty Awesome stuff. I live in Nevada and have eaten at Starbuck's many, many times and the person doing this blog knows what they're talking about when it comes to the tenderloins. They aren't that great. If only some of you realized how many places out there make incredible tenderloins (such as Cole's in Slater) you'd see how bland this one is. However, despite the overall boringness of the tenderloin, everything else about Starbuck's rocks. Their ice cream/sherbet is phenomenal. 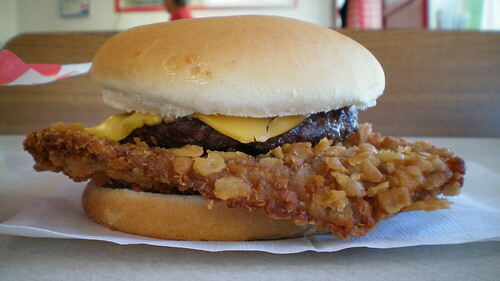 Their other foods such as the beefburger and their onion rings are actually quite good. Just because this guy says the tenderloin isn't good is no reason to pitch a hissy fit. He isn't dissing the restaurant - just the tenderloin, which I agree, is not that great.